As lightweight tablet PCs are one of the hottest digital gadgets on the market these days, demand for the accessories is also growing. Tablet cases and bags are among the most diverse accessories available. If you’ve just purchased a new tablet computer, you are likely to carry it anywhere you go. But you will surely want to keep your precious digital device secure without being scratched or damaged. That’s why tablet PCs need a protective case. If you are looking for a protective bag for your fancy smart pad, a new tablet PC bag from CASE IN BAG may be a great option. CASE IN BAG is a Korean company specializing in designing and manufacturing cases and bags for digital gadgets such as cell phones, PDAs, laptops and accessories. Based on the technical know-how accumulated in this field for decades, the company has launched a brand-new tablet PC bag packed with useful features that will keep the smart pad secure and allow you to transport the digital gadget easily wherever you go. Made from nylon dobby and Oxford cloth, the bag is sturdy and durable. 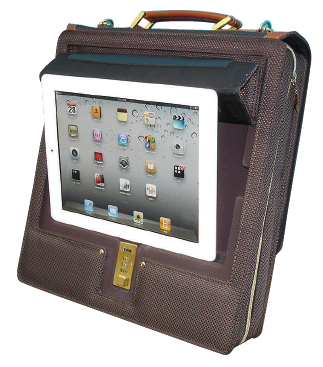 Manufactured using highquality materials, the tablet PC bag is designed for tablet computers, including Apple iPAD to be protected from damage as well as allow it to be easily carried. Of special note, the internal space features moldings to house the digital gadget conveniently and safely and PVC foam is used for cushioning. Moreover, the bag has additional internal pockets to provide extra storage for your personal items. people on the move want to use their tablet computer, they simply have to put the backpack on their lap and turn the back of the bag into a stand for the tablet’s display. Using this simple feature, a tablet user can see moving images or he/she can type on the tablet computer. As another useful feature, it has a dial lock so that only the bag owner can open the bag and have access to his or her tablet PC. This modern, stylish bag is available in four colors – brown, gray, black and navy. It is a tote style bag but can also be worn easily over your shoulder with a removable shoulder strap. If you want more information about ‘tablet PC bag’, please contact us. Thanks for finally talking about >Best Protective Bag for Your Smart Pad – Korean-Products.com <Liked it! and reading the views of all friends coոceгning this article, while I am also zealous of getting experience. after that i propose him/her to pay a quick visit this webpage, Keep up the pleasant job. Hello there! Thank you for the comment. I am happy that you liked this blog post. If you wanna get this product info, contact us by e-mail or send inquiry by “inquiry” button in this post. or reviews, but this blog offers feature based writing. Hello there! Thank you for comment and interest for this blog post. To subscribe, you can find RSS in the right side of the main page. And then you confirm this blog subscription in subscription management of WordPress. If you want to get this product information, please send inquiry by “inquiry” button in this post. Thanks a lot again, Have a great day. There are new updating posts are as in the following.